Updated Thursday February 22, 2018 by Webmaster. Our mission is to provide every player the opportunity to learn, love, and play the game of baseball with no player left behind. Together we can help our youth achieve great success within our community. Oakleaf Sports Association depends solely on the support of its community businesses, families and volunteers. Be a part of our wonderful community, lets build a tradition. Monthly Baseball meetings are held at 8:00pm on the second Tuesday of every month at the Plantation Oaks (phase 2) Clubhouse.All are invited to attend to hear the latest news and updates from the board. We encourage questions and suggestions at this time. If you have any questions, please contact the Baseball Director. 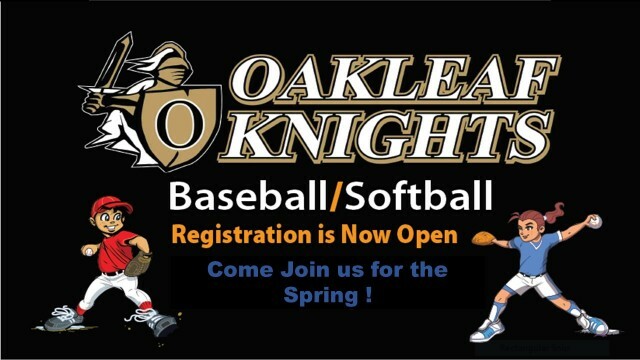 Oakleaf Baseball offers Spring and Fall seasons for boys and girls from ages 4 through 15.